Reduced balsamic vinegar is spooned with care so that it tumbles just so over polenta, mozzarella and roasted red bell pepper, puddling decoratively onto a Limoges china plate. The elegant dish is served to hungry patrons waiting at an intimate table for four formally set with a fresh flower arrangement, fancy glassware and folded sage green napkins. But this isn't a restaurant. This is Randy and Robin Graham's backyard deck, where they serve gourmet vegetarian meals for select guests – an unlikely pop-up restaurant – and here's the best part; it's free. “We do it out of the sheer love of sharing and having fun," says Randy, 63, a local blogger and cookbook author known as the Valley Vegetarian. A vegetarian since the '70s, "before it was fashionable," he says with a chuckle, Randy has been cooking since he married Robin 36 years ago, not only out of a curiosity about vegetarian cookery, but somewhat out of necessity. "When I met him, I had bread, peanut butter, cereal, eggs and Campbell's soup at home. I couldn’t bake a potato!" Robin, 57, admits. The recent retirees (both had professional careers in the public sector) moved from the Bay Area in 2008 into a charming 1,000-square-foot cottage in downtown Ojai. With their only son off to college, they found downsizing to be an easy decision. Randy's best friend since junior high lived here and helped persuade the couple to make the move. "We visited them through the years and fell in love with Ojai," Randy says. The house was turnkey, but they made one upgrade: a Viking four-burner white enamel range. On Robin's suggestion, Randy ramped up his cooking and started a blog, which then led to him self-publishing three cookbooks since 2012 on vegetarian cooking. Early influences in deciding to go vegetarian were mostly prompted by Randy's reckoning with a family history of heart disease, diabetes and obesity. "It was driven by diet primarily, and to a lesser extent, but equally important, not killing animals," Randy says. As a student at UC Berkeley living in a community spurred by the Alice Waters movement, a plant-based diet seemed easy enough in those days, but Randy saw a need to create recipes that wouldn't leave him or those he cooked for (many omnivores, including his wife) wanting more. His signature style has become what he calls, “Consistently good vegetarian comfort food." Much of that comfort comes courtesy of their own garden. The modest-sized home came with an equally modest-sized 6,000-square-foot backyard, which is where Robin focused her attention, installing raised planter beds for seasonal produce. The vegetable beds are surrounded by an ornamental garden dotted with hollyhock, ornamental grasses, foxglove, daisies, sunflowers, sweet peas and several other flowering plants. Marigolds and borage in the beds look lovely and help control pests. Fruit and pecan trees give the garden height and shade. Wood chips with dymondia groundcover planted between large flagstones serve as the garden's foundation. "My dad was a gardener, so as soon as I could walk I was out amongst the corn and tomato plants. I was fascinated by the silk on the corn," Robin recalls. The garden's focal point is the pale sage green deck covered with flowering wisteria and decorated with succulents and climbing potted blueberries. Artichokes – some left to bloom into striking neon purple flowers – border the deck. 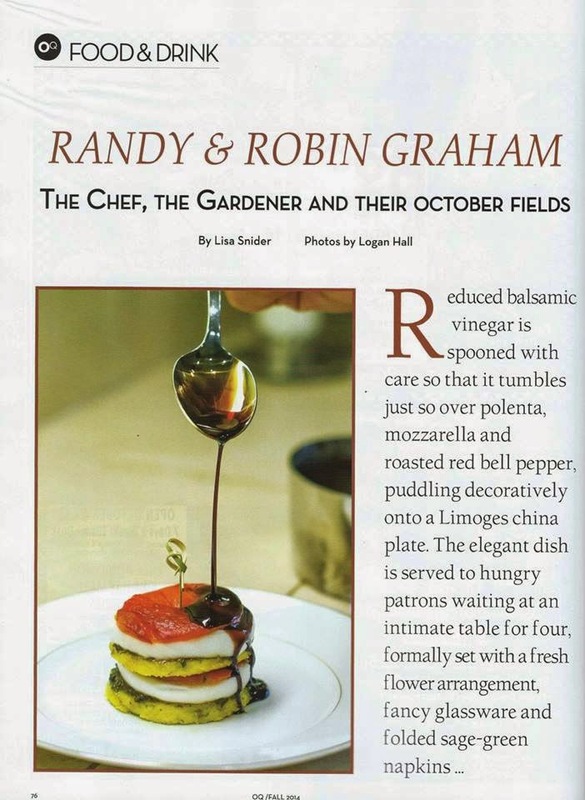 Creating a garden proved to be the perfect retirement hobby, giving Robin something to grow and Randy something to cook. "We only grow what we will eat at home. There’s no sense in growing anything you don’t like," Robin says. The hobby quickly grew into a desire to give back to the community, and after becoming a certified master gardener, Robin gave her time to the Ojai Valley of the Moon community garden on the Help of Ojai West Campus. Over a two-year period, the one-acre site donated 1,500 pounds of organic food to the Help of Ojai senior lunch program. Back at home, Randy and Robin enjoy a quiet moment on the deck while their dog sniffs in the garden. "Willow loves to chew on the lemon grass," Randy says, which is fine with him since he only uses the bulbs. Randy says he loves this time of year. "October is my favorite month. It’s the last transition of our garden. It’s the last time I can pick things until mid-winter." He rattles off a list of vegetarian casseroles, soups and baked dishes – all perfect for fall. Recipes, he says, that are "good and hearty food that keeps your belly warm." Not only is a vegan lifestyle more healthy, Randy says, "It’s easy, convenient and good." · Butternut squash steamed and mashed with brown sugar or just scoop it out with butter and herbs and roast in the oven. “He makes an awesome soup with it, too,” Robin says. · Kale ribbons sautéed in olive oil with balsamic vinegar and fresh lemon. “I eat it right out of the pan,” Randy says. Cook’s Tip: Reduce aged balsamic vinegar by half to get a sweeter, more concentrated flavor and a thicker consistency. Gardener’s Tip: Chill slices of cucumbers in ice water and plate just before serving for a nice crisp crunch. Gardener’s Tip: Growing garlic is easy. "When the flower bends, that's when you know to pull it. Lay it on top of the ground to dry out for a week,” Robin says. Peel and freeze the bulbs, pulling out just what you need. For the Polenta Napoleon and other vegetarian comfort recipes, or to buy one of Randy's cookbooks, log onto www.valley-vegetarian.com.